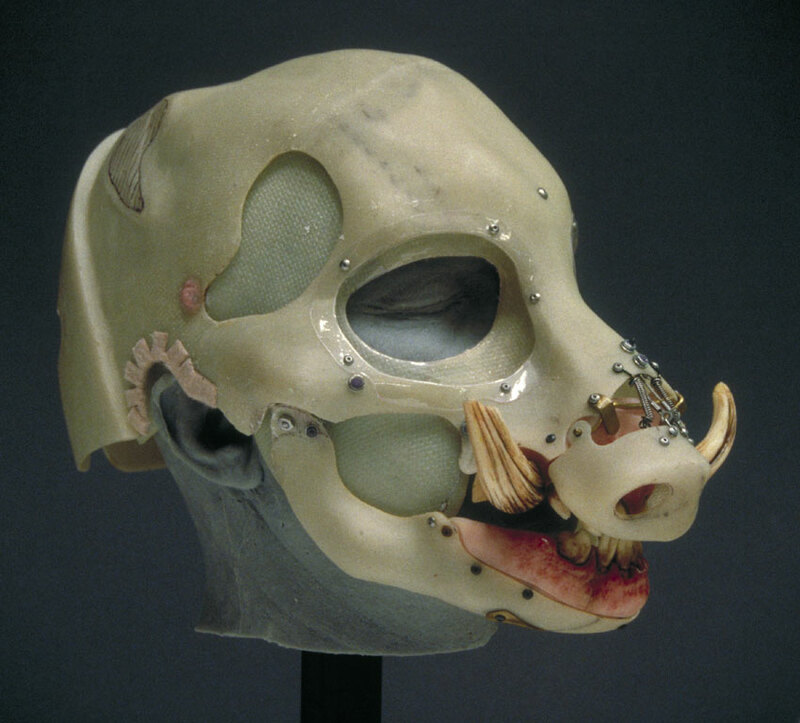 I have seen creature masks with jaw operated mouths. The opening jaw pulls a cable that activates a upper lip movement. I have tried this in the past and failed. I placed the hinge point of the mouth too far in front. The boar man from the 90's Island of Doctor Moreau is a working example of what I am looking to make. All of the work I have seen has the lip movement as a separate cable, not tied to the opening of the jaw. If you look at your picture of the boar man, there is no way to attach a cable to pull the top lip up from the bottom jaw. They would actually conflict with eachother, pulling down to pull up. Just make another movement point separate from the jaw movement. I think you will see that this allows for better puppetry as you can then have the upper lip snarl without the jaw opening. It will also help if you are going to try to puppeteer the lips to talk. Here is a better example of what I am talking about with a alien costume. Depending on how far he open his jaw the lip moves of the alien move, followed by the mouth opening. Hi Jared, Now I understand what you are talking about. The movement is still done by a second control. The camera work is really poor to be able to follow the mechanism, but at the end of the clip you can see the person is holding a controller for some servos. I think the servos are controlling the lips. Watching the video again, especially when they are joking about barking like a dog, the lips do not move when the jaw does. Now the cool thing is that the comment on the video post says you can contact him. Why not see what the guy says. He might be willing to let you know how he did it. Lots of cool other videos along the side. You have a very interesting puzzle to figure out. Are you going to do a head rigging like this one? Yeah, he is holding a remote. I did not notice that. I don't want to attempt something that size at the moment. 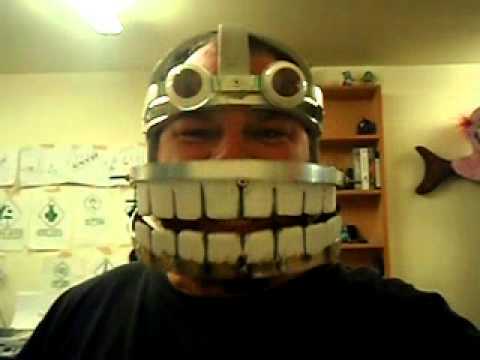 I am going to make a ninja turtle costume for a party, and wanted build a working jaw for it. I may want to make a short film with it later. Now I see and understand what you are going for. Would like a side view on that last link, but.... I want to help you out with this. I think, from watching this last video, that the jaw mechanism that works the entire thing has several connections to it. I think there are shorter cable connections to the lips so that as the wearer starts to open their jaw, the lips start to move. The character jaw would not start to open until the wearer has their jaw more than a quarter of the way open. You might think about the placement of the lip cables towards the back of the jaw so that with little jaw movement the lips start to move. Use the size of the head so that you can secure the cable. Sorry, quick thought. The lips seem to move in sync, like they are a clam shell opening and closing. If you can make the mechanism work like the opening and closing of scissors, with the attach points on the bottom lip, you could then have the top lip slaved to the bottom. Oh, on the video I did hear a lot of the movement of the mechanism. You should try to use elastic instead of springs to help the lips return to their original spot when you close your jaw. I hope these thoughts of mine help. It would be a lot easier to be physically where you are to show you my thoughts. But I think a scissor type of mechanism would work on the lips. The mechanism he used has a patent on it. I have asked him on other boards about it, but did not receive an answer.I don't think he is going to reveal his secret. I figured I would bring my question here to see if I could get some help figuring it out. 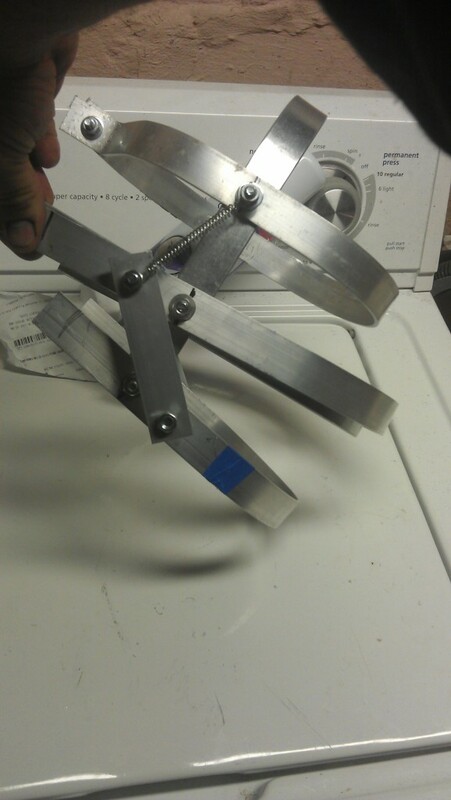 I have found more pictures of a head rig similar to the one the uses used. Your hypothesis seems very accurate. His costume seems to be popular with folks. I can understand his patent. You can test out your own design by making the test unit out of thick cardboard. It allows you to watch how your design works without spending a lot of money on metal. You can use string and rubber bands to be the cables and springs. Once you get it working the way you want, you can then make your final piece. I am glad my thought were close. The picture looks like the lip mechanism has not been added yet, just the jaw. I figured out what I was looking for in the strangest of places. A Star Wars site called the dented helmet. Turns out what I was wanting to do is what people do with Chewbacca masks. 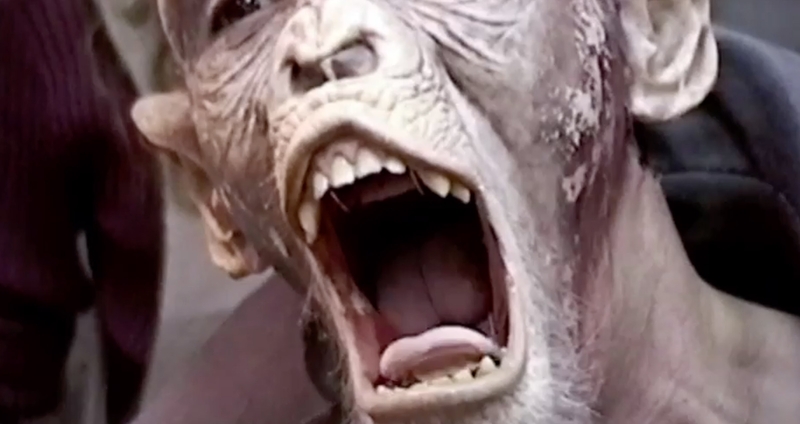 I was watching the Stan Winston Experience and there was a lot of footage of Stan being made up to be an ape with an articulated lip. This was attached to his own lips. Not sure if the guys up top will post pictures of this. 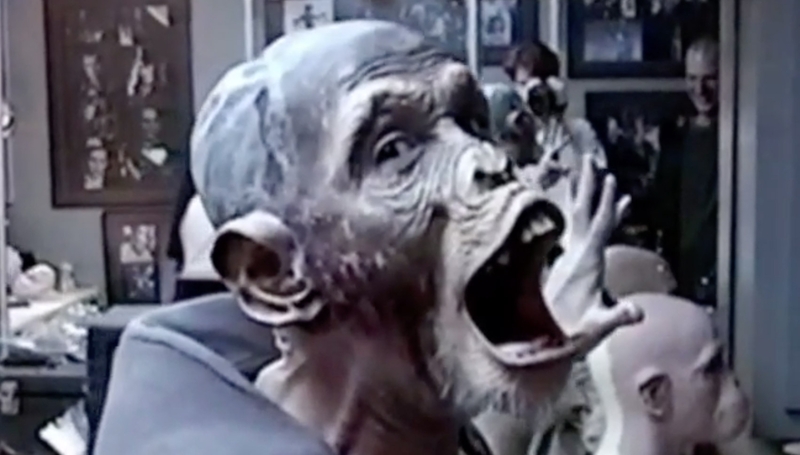 The planet of the apes test makeups were based on a technique where jaw movement is translated to the lips of a makeup or mask. The more you open your jaw, the more the lips open. 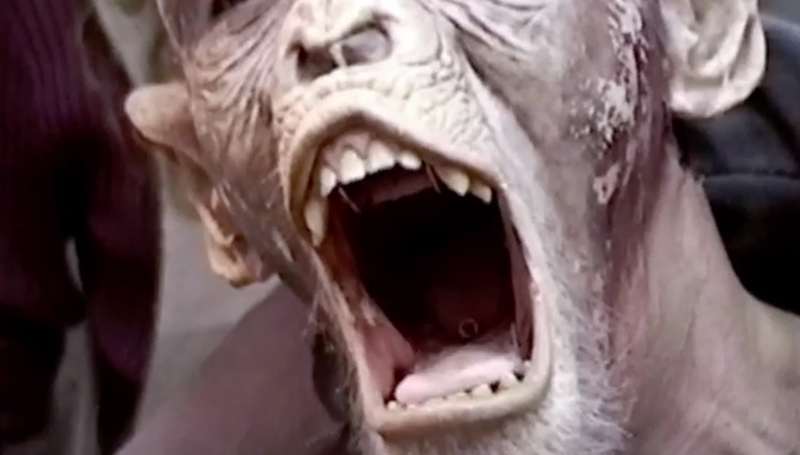 The tests for planet of the apes were taken a step further by adding attachments to the performer's lips for more articulation, and a tongue extension. Sadly the attachment points for the lip are all internal, so they can't be photographed with the skin on. If any ever surface I'll post them here. Many thanks @Chris Ellerby for this. When I watched the Stan Winston Experience I was captivated by this non animatronic creation. Maybe Richard Landon might have some knowledge of where the attachments were as he was with Stan at the beginning Still it is a brilliant innovation that beat's the CGI direction.